S&S Coach is committed to your group's safety. Our founder served on the original committee of State Patrol, state officials and industry leaders to set up the Ohio State Safety Inspection Standards. These standards became the basis for the Ohio Bus Inspection Program and continue to insure the safety of the Ohio motor coach industry. S&S Coach has a written maintenance program which meets or exceeds all regulatory and manufacturer preventative maintenance standards. We have our own full-service garage and our full-time staff mechanic has over 18 years experience. Follow the link below to the U.S. Department of Transportation Safety and Fitness Electronic Records (SAFER) System for a "Company Snapshot." Enter our USDOT number: 98478 to view our safety rating, inspection and crash history, even insurance information. Many companies advertise Department of Defense (DoD) Certification. The program ensured that DoD contractors' vehicles were inspected at least once every 24 months by an independent, third party. The U.S. Department of Defense ended the Passenger Safety Inspection Program in 2017. S&S Coach participates in the Ohio Bus Inspection Program. The program requires each vehicle be inspected at least annually - twice as often as the former DoD Certification standards. Every vehicle in our fleet undergoes independent, third party inspections at least every 12 months. The Ohio Bus Inspection Program also includes random road-side inspections, which often results in an average of one independent inspection every month. The results of these inspections are public record and available by using the above Company Snapshot Safety Data from the FMCSA link. On April 10 and April 11, 2018, Motor Carrier Enforcement Inspectors for the Ohio Highway Patrol inspected each of S&S Coach’s motor coaches at the company garage located in Lexington, Ohio. S&S Coach received its annual safety inspection decals for each motorcoach. 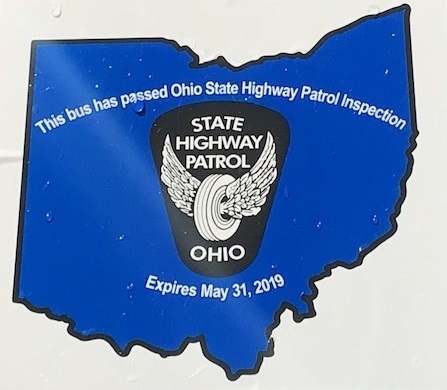 Each bus in Ohio is inspected by the Patrol once per year, and a decal is placed on the vehicle when it passes inspection. These vehicles include charter busses, airport shuttle busses, and any other bus that might be used in commerce. These inspections are very similar to the annual state inspections conducted on school busses within the state. This program began several decades ago when the Ohio Bus Owners Association approached the Patrol to start an inspection program. Like in the commercial trucking industry, good carriers welcome the inspection program because it helps to keep unsafe carriers off the road.